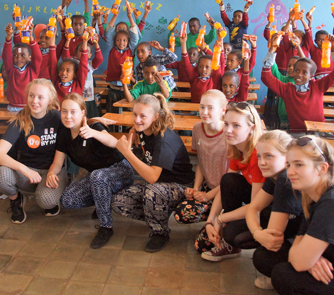 Over the Easter holidays a group of pupils and staff, accompanied a representative from the charity, Stand By Me on a trip of a lifetime to Ethiopia. Ethiopia is one of the poorest countries in the world. Famine, HIV/Aids and extreme poverty have resulted in millions of orphans and a life of hardship for the majority of its population. Nearly one million children are orphaned as a result of HIV/Aids. A lack of investment in education and a high dependency on child labour has left five million children without access to an education. Educational opportunities for girls are lower than boys as they are expected to do domestic work or marry at an early age. Home for the 10 days was within a town called Bekoji, which opened everyone’s’ eyes to a new level of poverty. Moved by the commitment of the local church to provide education, Stand By Me adopted the Bethany School in 2006, where today the charity is providing the poorest children with a quality education, daily food, health care and family support. The Bekoji Children’s Home was later opened to care for orphaned and at risk children. The Abdi Academy opened its doors in 2013 to meet the needs of children in Dembi Dollo. “Our first day of working in the school was a Sunday. Our task for the day was to design and decorate the kindergarten classroom. A rather dull yellow walled classroom was transformed in a day to an underwater themed wall, incorporating the alphabet among the jellyfish, sharks, seaweed and coral and a woodland themed wall with numbers 1-10 on the tree trunks with the grass festooned with lady birds, beetles and snails with butterflies floating between the trees. The two remaining walls were freshened up with paint to complete the transformation. The look on the children’s faces on the monday morning when they had their first lesson was one that will never be forgotten. Well done to Verity and Abi for their creativity in designing the walls. While waiting for our base coats to dry we attended the local church. Despite the language barrier, the love of God and passionate singing, and to our surprise, dancing will be another of our long lasting memories. Headteacher Mrs Tudor won’t forget this visit as she was asked to address the congregation with no warning, but spoke with passion about our journey, our pleasure to be welcomed by the community and what we hoped to achieve. We were able to achieve a remarkable amount in our short time in Bekoji, because we were so well-resourced by the sheer number and sizes of donations from our school community. We took over 1000 sets of underwear with us so that all of the children in the school were given two pairs each and children at the high school received one pair each. The children also received a toothbrush and toothpaste. The second hand clothing we took out was distributed on our last morning and it was heart-warming to see the response of the children as they received a hoody, a pair of tracksuit bottoms, a dress, jumper, a pair of shorts or a t-shirt. It was fantastic that we were able to give every single child in the school at least one item of clothing. Our thanks go to Waverley school who donated all of their old style PE kit for us to take out with us. The 22 home children were all given additional clothing including a pair of pyjamas and a t-shirt in addition to what they received in school. The sports equipment caused great excitement and we had fun working with the children, from kindergarten up to grade 8, playing relay games, football and volleyball each afternoon. The craft activities we did with the children included colouring in card figures, making pom-poms, colouring polystyrene eggs on string and making pipe cleaner jewellery. It was very poignant when we visited some of the children in their homes to see the card figures we had coloured in with the younger children on the walls of their homes and the students wearing the pipe cleaner items that they had made. During the mornings we built beds for the local community. The girls were very proficient in hammering in nails by the end of the week! The money for the materials to build the beds was predominantly raised in school and every form group came up with a range of ideas to raise money. Year 8 were the top fundraisers with both tutor groups raising a combined total just short of £600; a fantastic achievement. Fundraising activities included car washing, cake sales, a fun run in fancy dress, sponsored silences, being three legged for the day, guess the number of sweets in the jar, smoothie and hot chocolate sales, to name but a few. Thank you also to parents, families and friends who made cash donations. A lack of affordable sanitary products prevents girls accessing school. We took out in excess of 1000 sanitary products, including a number of reusable items which will enable the girls who received them to always be able to attend school. The school nurse was thrilled with the huge bag we carried out with us. These will be handed out as needed. Our final category of donations was stationery and calculators. We had been asked if we could buy enough of the same type of solar powered calculator so that the whole class (normally 40 pupils) could easily follow the instructions given by the teacher. None of these children will have ever even held a calculator, the excitement during that first lesson was palpable. We also received (through donations) five scientific calculators; two of these were given to the staff at the school and the other three were given to our interpreters. Our interpreters were three 17/18-year-old boys who had been at the school and who were now preparing to sit exams in the hope of gaining entry to one of the top universities. When we gave them the calculators, you would have thought we had given them a new laptop. They were thrilled because education is their way to a brighter future and the calculators we gave them were going to help them in their studies. In the evenings we prepared for the following day’s activities and also practised our songs that we were going to sing to the children in the home and to the school. Sitting around the table with Mrs Tudor playing the ukulele and the group working and singing songs such as The Lord’s my Shepherd, gave us a very special time as a team. Each morning we spent a few minutes reflecting on what we had achieved, the impact our activities were having on us and the local community and asking God for guidance and at times, the energy to give the children the best experience we could. Thankfully we were listened to and although tired, we were able to still provide the children with a range of exciting activities. We finished the trip with a visit to Awash Falls which were spectacular. The river was crocodile infested, so no swimming or walking near the river banks!! It is often said that those who have the least give the most. That was certainly the case with our sponsor child, Asrasash. We visited her and her mother in their home (a mud constructed hut with a small room to live in and an even smaller room to sleep in) and were given two crochet pieces that they had made for us. They were beautiful and will be displayed with both pride and humility in school. Finally, the students we took out with us were superb. They worked hard, didn’t complain about the fact that there were very limited water supplies (one shower in the week!) and spent as much time as they could with the children. Our next group will have a lot to live up to!